This Taylor of Old Bond Street Gift Set contains a Handmade Pure Badger Hair Shaving Brush, a Black Handle Mach3 Razor and Taylor's Jermyn Street Shaving Cream Tub, making the perfect Gift Box. The Cream - Taylor's Jermyn Street Shaving Cream has been specially formulated without parabens and allergens to help those affected by razor burn, razor bumps and shaving rash. Jermyn Street Shaving Cream provides a rich cream that facilitates a close smooth and comfortable shave. A little goes a long way with this luxury cream. The Brush - The Pure Badger Hair Shaving Brush will produce a smooth and creamy lather that will soften and lift the bristles making for a close and comfortable shave. 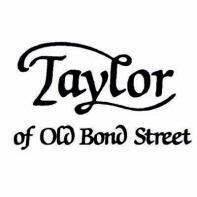 The brush is branded in white lettering 'Taylor of Old Bond Street, London England. Pure Badger Handmade in England'. The Razor - The black handled razor is Gillette Mach3 compatible and precision weighted to give a close, comfortable shave without any tug and pull. The razor is branded in white lettering 'Taylor of Old Bond Street, London England'. For best results, use the brush and a few drops of warm water, lather the cream for around 1 minute in a bowl or directly onto the face until a rich, thick and emulsion-like lather is formed then paint onto the face. A fabulous set that any man would love. The Jermyn Street Cream scent if perfect for men of all ages and will leave the skin feeling soft and moisturised. A wonderful gift or even a treat to yourself -you'll have years of use out of it. Not the set you were looking for? Click here to browse our extensive collection of shaving sets to find something more suited to you.